Immaculate and stylish second floor tenement flat located in popular Thornwood/Partick area of Glasgow's West End. This flat is immaculate throughout with attractive furnishings, high spec fittings and will make a fabulous home! 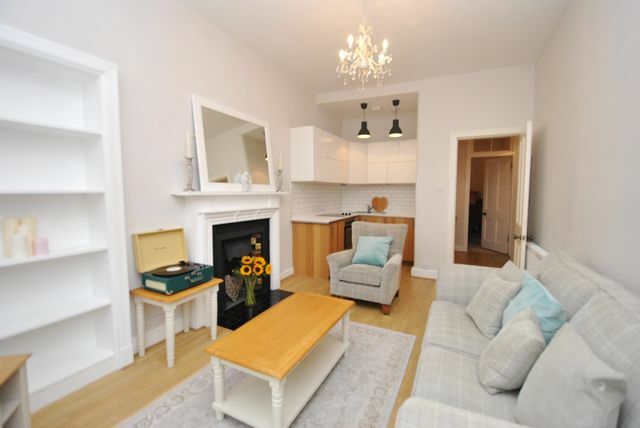 The property comprises welcoming entrance hall, stunning bay windowed living room which is cosy and homely with feature fireplace - with kitchen situated in the recess housing clean, sleek units and integrated appliances. There is a bright, spacious double bedroom to the rear with generous walk in wardrobe and the property is further complimented by a modern bathroom with shower over bath. Gas central heating, double glazing, secure entry and street parking to front of the property. Frequent public transport links from Partick overland train or underground and quick access to all major roads.